Here’s an important tip: the Court of Appeal for Ontario, Canada, has ruled that lawyers who notice that their trial judge is sleeping must awaken him or her at the time and object, rather than waiting to raise the issue on appeal. The case, Leader Media Productions v. Sentinel Hill Alliance, involved a complex financing arrangement, the details of which are neither relevant nor, obviously, very interesting. After Sentinel Hill lost, it argued on appeal that the judge had not sufficiently explained his decision, that he had not heard oral argument, and, in an argument raised for the first time on appeal, that he “was unable to follow much of the trial evidence” because he was often sleeping. Instead of confronting the trial judge, after discussions among appellants’ counsel . . . they made a deliberate decision not to raise the issue[, but rather] to “wait and see how things played out”. Presumably, if the trial result was in their favour they would do nothing; if not, they would have this additional evidence to use as a basis for appeal arguing that they were denied the right to a fair trial. The court held that this was not appropriate and that, instead, parties must wake up sleepy judges and raise an objection at the time. The parties apparently found only two prior cases involving sleeping judges, which is a little surprising since there have been many others, as they would have known had they only been readers of Lowering the Bar. For example, respondents could have found the High Court of Australia’s 2008 decision reversing two convictions because of a sleepy judge. (The intermediate court had held a new trial wasn’t warranted because being “constantly attentive is not a fundamental requirement” for judges.) 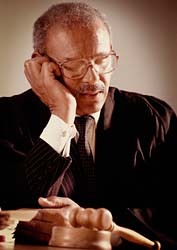 And appellants could have found a study reported in Sleep magazine analyzing 15 similar cases, finding that “[in] 10 cases, judicial sleepiness resulted in a retrial . . . .” See Grunstein & Banerjee, “The Case of ‘Judge Nodd’ and other Sleeping Judges – Media, Society, and Judicial Sleepiness,” 30 Sleep No. 5 at 625 (2007). But they didn’t. A Nigerian judge on the International War Crimes Tribunal who had “regular sleep episodes” during a 2001 prosecution.